I’m spending what will probably be way too much time lately putting together a ton of materials for our homeschooling this coming year. We don’t have an official start or end date…we kind of just do whatever we want whenever we want. The beauty of homeschooling, you know? Total freedom. This year, it’s our goal to be a little more intentional about our learning. So far it’s been mostly a fly-by-the-seat-of-our-pants type thing. The kids have had lots of books, we read with them, they watch educational TV shows, they cook with us, they work with money, we attend weekly co-op meetings and field trips…. But now, we’re doing a little more. We’re very relaxed about how we handle learning, and I don’t want to change that. I have tried, at various points in our home education journey, to have sit-down lessons with workbooks and whiteboards. Every single time ended with meltdowns from all, babies on top of our materials, and no learning from anyone. Instead, I’m preparing our environment to be rich with options. I’m also planning just a few very relaxed unit studies that will include tons of hands-on projects and field trips. The kids and I talked about it, and I took their interests into consideration and came up with a few topics we’re going to tackle this year. Today I’m going to show you how I’m preparing our environment. I printed several scenes from the book Fun with Play Dough. Each scene has a different look and a different goal. In one, they get to decorate a cupcake. In another, they’re creating a farm. I’m planning to make a few different colors of naturally-dyed play dough to go along with it. It’s really for preschool-aged children, but I know that all of my kids will get into this. It’s good for creativity, dexterity, and more. Along a similar line, I’m creating some giant (3′ x 6′) felt scenes for them. These will hang on the wall, and the kids will be able to move pieces around and create their own themed scenes. I did this with a Christmas tree last year, and I’m working on a farm scene right now. I plan to do an ocean scene later, and others — not sure what yet. These cards are from the book Let’s Classify! There are 300 different items, one per card, with an image and the name of the item below it. There are tons of things you can do with these — sort by color, by living/not living, by plant/animal/mineral, etc. My oldest said she plans to use them to learn some new words, by identifying the picture and noticing the letters. Some of the cards are easily-recognizable items (butter, egg yolk, grass, etc.) but some are things that are new to my kids — like exotic animals. We’ll probably sort through the cards and find things we don’t know, then look them up and see what we can learn. I’ll most likely be learning along with them! I have four different versions of these. One is Homophone Rabbit Puzzles. There are others for synonyms, antonyms, and homophones. They are cute little puzzles where kids have to match the two words together and learn the differences between each. We most likely will not do these right away, because they’re a little more advanced in reading than my kids are, but after we keep reading our books, we’ll get to these. Ironic: my son (7) doesn’t always recognize words like “this” or “that,” but he sure does know “play,” “shuffling,” “Minecraft,” and other words he uses in his favorite games! Kids latch onto the words that are important to them. I have printed several of the pieces from Add and Subtract with Maxwell Mouse. There are blank pages with boxes to add numbers or subtract numbers (like box + box = box and you add number cards). There are also lots of little mouse and cheese counters, number cards, and several pages of problems. The pages of problems only have 4 per page, so they’re quite large and easy for little ones to read. We are very science-based around here. The other day, my daughter raided my pantry and bathroom cabinet and took coconut sugar, cinnamon, Epsom salts, baking soda, water, and possibly some other spices, and spent a good hour in the bathroom, doing “chemistry.” She said the mix she came up with worked really well to clean mirrors. I’ll include the kids when we make play dough, and show them how the mix changes from a thick batter to a true dough when it’s heated. Baking and cooking experiments are chemistry, too! I have several different books of simple science experiments, a crystal-growing kit, big bags of cheap salt and sugar (we plan to try to saturate water, heat it, freeze it, and grow crystals with it), and other items. We encourage the kids to be really hands-on with all of this. And it’s something we can all do together! Geography is something that we’re adding in this year. The kids have been fascinated with maps for a while, so we’re going to take the time to study them a bit and learn about America — the states and capitals and historic places. We have a flash card game that teaches states, capitals, and state abbreviations. We also have a board game that teaches historic landmarks and national parks. We really like games around here! I’ve also sewn a giant world map quilt that we will hang on the wall. Once we’ve finished our geography study — or least, have gotten into it pretty well — we are going to dive into some American history, specifically looking at pioneers and the Westward expansion (those will be unit studies). I’m sure there’s more — but these are the things we use often! And yes, we’re all definitely nerds. We love our Doctor Who and board games. That’s our “environment” for this year! We’re always adding to it. Soon, I’ll share with you the unit studies that we are doing on geography, pioneers, and nutrition! 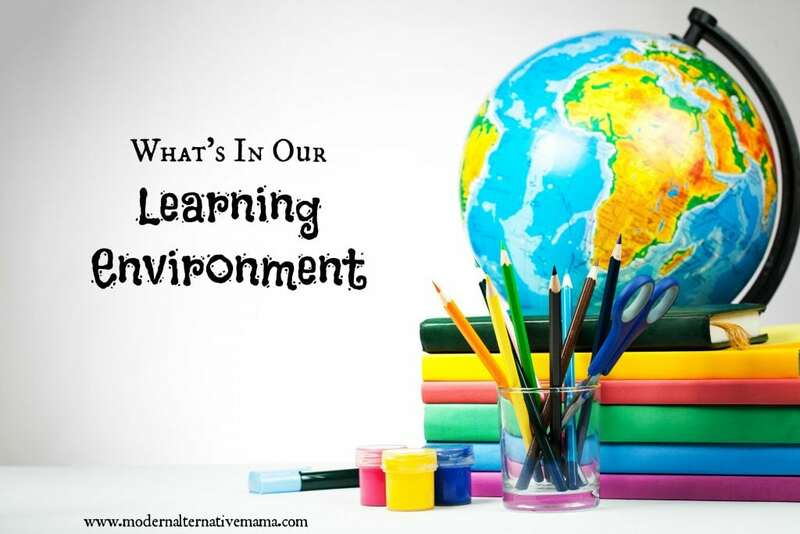 What’s in your learning environment? Three cheers for Doctor Who!! What geography game did you find?